Back when the temps outside were frigid and snow was on the ground, I attempted to make Local Kitchen's Salted Cranberry Grapefruit Jam and it was a bust. The original recipe called for 1 red grapefruit cut up, to include the skin. When I made it, the bitterness of the grapefruit skin slapped me upside the head and I didn't like it one bit. I also felt it needed a little more sugar. But I did like the other taste profiles it had to offer, so I gave it another stab. 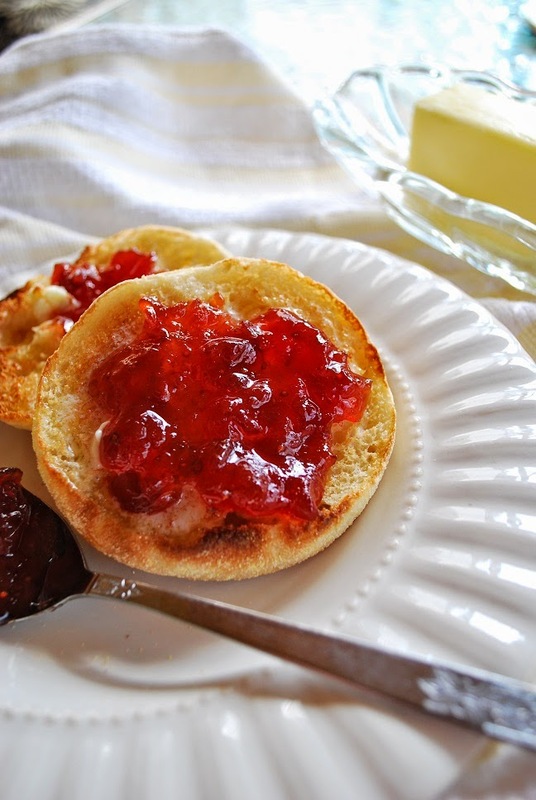 My newer version has just the right amount of salty/sweet/tangy, and it's definitely a grown up jam. This isn't the sticky, sweet, typical fruit jam you're used to for a bagel or toast; however, it does just fine for that in a pinch. No, I foresee this jam to be used on turkey or ham sandwiches or brushed over a crispy pork roast as a glaze. Again, a new favorite. Day 1: Peel both grapefruit and remove as much of the white pith membrane as possible. Cut the grapefruit flesh into small pieces, about 1 inch in size. Combine the cranberries, grapefruit flesh, water, white wine, sea salt and sugar in a wide Dutch oven or stockpot and bring to a boil. Reduce heat to a simmer and cook mixture for 15 minutes. Remove from heat and cool. When completely cool, cover and refrigerate over night. Day 2: Bring mixture back to a boil over med/high heat and boil until mixture reaches gel stage (about 20 minutes or 212 degrees), stirring constantly. Ladle mixture into prepared jars and process in a boiling water bath for 10 minutes.